(CNN) -- Singapore's economy shrank by 4.2 percent in the fourth quarter of 2008, the Ministry of Trade and Industry said Thursday, as it forecast the economy would contract between 2 and 5 percent this year. 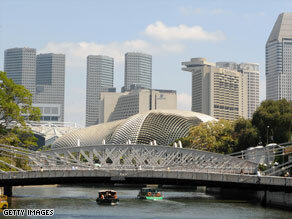 Boats ply under a bridge near the financial district of Singapore. Compared to a robust growth of 7.8 percent a year earlier, the economy grew by 1.1 percent for the whole of 2008, the ministry added. It called Gross Domestic Product growth prospects for 2009 "weak ... on account of the pessimistic global economic outlook." All major sectors, except for construction, business services and information and communications, saw contractions, the ministry said. The ministry cited a decline in private sector investments and private consumption expenditure for dragging down total domestic demand. Declines in global demand for electronics products, pharmaceuticals and chemicals were also likely to weigh on the manufacturing sector.